Days after Donald Trump recognized Jerusalem as Israel’s capital, a class of MBA students from China Europe International Business School (CEIBS) touched down in Tel Aviv for a week-long innovation tour. I was invited along too. For over two years now, I’ve written stories about full-time MBA programs, business schools, and international trips, but I’ve never had the chance to experience them for myself. When the opportunity came to spend a few days in Israel courtesy of CEIBS and Knohao—a leading tour company for MBA students—I jumped at it. In the most difficult of environments, Israel’s high-tech startup scene continues to thrive. Israel has the largest number of startups in the world in proportion to its population—around 3,500 companies, mostly in high-tech. Israel ranks third in the world for innovation in the Global Competitiveness Index. Its startup success stories include Waze—a mapping startup bought by Google for over $1 billion in 2013—and Mobileye, an autonomous driving tech startup sold to Intel for a record $15.3 billion this year. “Israel has appropriated an association with innovation,” explained CEIBS Professor Shameen Prashantham, speaking to me over a hearty lunch on campus at Bar-Ilan University in Tel Aviv. “Much like when you think of chocolate, you think of Switzerland; when you think of innovation today, you think Israel. Chinese investment into Israel jumped to $16.5 billion in 2016, according to Thomson Reuters. Playtika, an Israeli online games company, was sold for $4.4 billion to a Chinese consortium in 2016. Ahava, a popular Israeli cosmetics firm, was also acquired by Chinese investors. And there are shared Chinese Ofo bikes on campus at Bar-Ilan. The CEIBS MBA Israel immersion began with a VIP panel session on geopolitics at the impressive Yitzhak Rabin Center, featuring Dr. Yossi Beilin—the former Israeli politician who initiated the Oslo peace process between Israel and the Palestinians—Palestinian representative Sari Nusseibeh, and Efraim Halevy—former director of Mossad, Israel’s CIA. For Rodrigo Laniado, an Ecuadorian MBA student who joined CEIBS from a management role at his family shrimp business, the spy stories and exclusive insights from high-profile figures made the VIP panel his highlight of the week. “I’ve always wanted to come to Israel,” he told me. “Before we came here, we saw the news on CNN about the protests and the violence. But, coming here and experiencing Israel first-had, I’ve realized just how the media can exaggerate events. 2018 CEIBS MBA student Qiu Zhong (Flavia) echoed Rodrigo’s view. She’s joining a Chinese private equity company next year—a job she got through the connections she made at CEIBS. There were delays on the trip’s second day. Tens of thousands of ultra-Orthodox Jews—10% of Israel’s population—marched through Tel Aviv’s streets to mark the funeral of a leading Haredi Rabbi—an insight into Israeli society’s religious-sectarian divide. Lectures at Bar-Ilan University explained the genesis of Israel’s startup scene; the excess supply of engineers following the cancellation of the Lavi military aircraft project; the Israeli ‘chutzpah’, self-confidence and drive; the need to innovate to survive; and the critical role of compulsory military service. Professor David Passig, who predicted 9/11 and the financial crisis, highlighted an impeding population crisis, while Dr. Haim Cohen spoke about a pill that can make you live longer. Throughout the week, there talks by entrepreneurs from a big data-crunching sports-tech startup and a mobile gaming app proven to relieve stress, and visits to Netafim—an agri-tech company started by members of a Kibbutz, a collective socialist community—and Pitango, a leading Israeli VC. 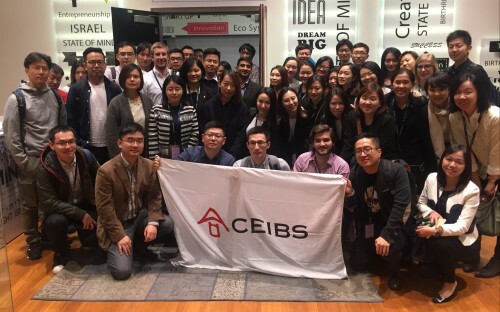 CEIBS MBA students also met with former members of Israel’s cyber spy agency Unit 8200, who account for 1,000 of Israel’s startup founders, and enjoyed cultural trips to Caesarea, Haifa, and Jerusalem. “Israel has become one of the most popular trip destinations for business schools,” explained Roy Chason, former CEIBS assistant director and founder and managing director of tour company Knohao. “The information students get here, the openness of Israelis, and the access to top-level people, is completely different to what students would get in Silicon Valley. Over the course of the week, one story that stood out was that of Tzameret Fuerst (pictured right), co-founder and former CEO of PrePex, a non-surgical medical device for adult male circumcision designed to prevent HIV in Sub-Saharan Africa. She spoke of her struggles as an entrepreneur—dealing with doing business in Africa, opportunist partners, governments, huge industry bodies—and the many hurdles on the road to selling over one million devices. CEIBS MBA student Jiang Yue is considering transitioning into consulting after graduation, but Tzameret’s story has opened her mind to the possibility of entrepreneurship. “I never thought I’d be in this part of the world, looking at startups in Israel,” she said. “CEIBS has a very entrepreneurial slant to it—the school is a bit like a startup itself. It’s fairly new and ranked among the best in the world. The mindset is that anything is possible, you just have to go out there and do it.